A new co-operative, fast-paced, cyberpunk tabletop boardgame. Tactical combat and detailed miniatures await you in the dystopic future. Cyntopia - the future is now is a fast-paced and action packed tabletop boardgame taking place in a dystopic future. You will fight huge corporations as an Edgewalker, making your living while flirting with the Edge. Will you fight or will you fall? While easy to understand and fast to play the game features enough optional rules to provide an intense gaming experience even for the die-hard RPG enthusiast. The game will be produced in English and German in addition the rules will be available for download in Spanish too. This project will be realized by our team of independent artists, it will be produced by LudoFact (known for producing Zombicide and other CoolMiniOrNot games) and shipped by Wayland Games. Play co-operative with your friends, play alone, or team up and play against the gamemaster. The game is designed to be playable with 1-7 players. Dynamic level of difficulty based on the number of players. Easy to learn system, so gaming can begin within minutes of opening the box. Fast-paced combat system with simple rules for beginners and advanced tactics for tabletop veterans. AI-System to determine the actions of NPCs. Improve your character through loot during the mission or use earned credits from previous successes to buy items upfront. Modular gameboard which can be composed of 40 floor tiles, so each Edgewalk experience can be unique. The campaign book will guide your first Edgewalks, showing you the way into the future. Alternatively use mission- and corporationcards to create a wide variety of random missions every time. Advanced and optional rule suggestions for deeper gameplay mechanics are already included. Deadeye: Long-ranged combatant. She and her rifle will make sure you don't get into another ambush by the corporations. Psionic: Telepath. By combining his native rituals with an unbreakable instinct to survive, he forces his way into enemy minds. Ronin: Melee specialist. Disciplined by the codex of his clan, his determination is as sharp as his swords. Cyborg: Heavy Gunner. Once brought down by a grenade, he has returned cyber-enhanced and even stronger than before. Fielddoc: Medic. Her dedication and experience may be your last chance to survive. Gunslinger: Small firearms. He carries out his raging revenge in close and rough combat. All in line - renders for all previously introduced playable characters in the game. We want to provide you with a broad range of possibilities to cover your preferred combat style. Careful and tactical? How about long-range, a medic and telepath? On the other hand - how about a group of tanks? You are able to combine various characters to create a new group each time to match the style of roleplay you desire. Guard: Your everyday soldier having to guard every corner for the corporations, while being the lowest pay-level. 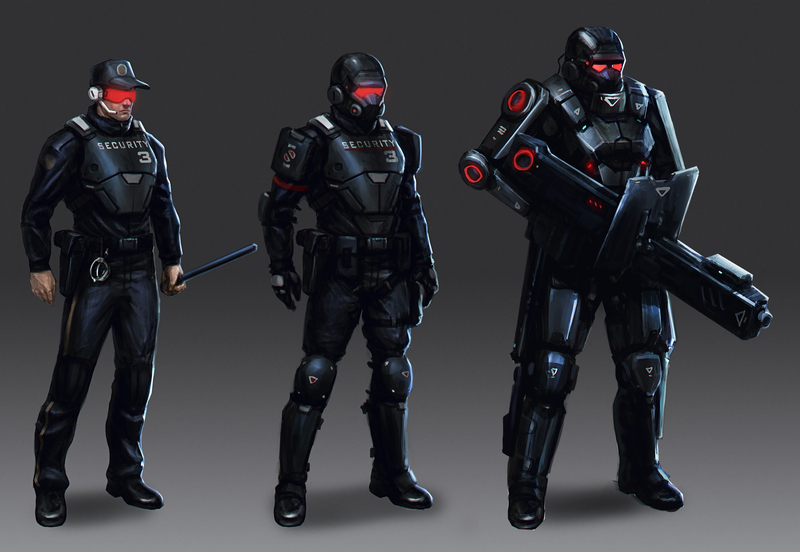 Trooper (Assault and Shield): Enhanced in weapons and armor - adding the necessary firepower and shields to a troup of his guards for a more serious fights. Squadleader: Being heavily armored and equipped with powerful firearms, he is a titan compared to his collegues, leading them against invaders. Renders of the enemy miniatures, including the Assaulttrooper and Shieldtrooper. 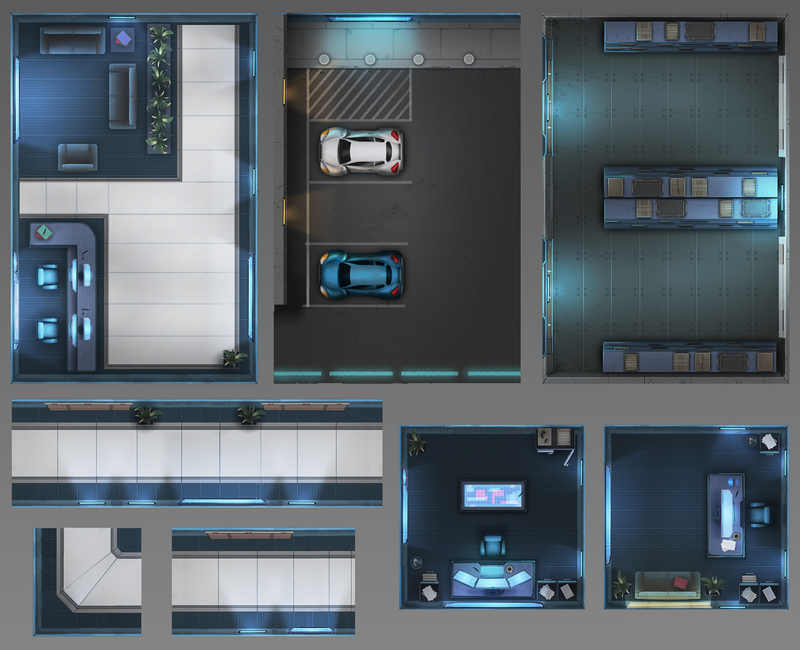 State of the art - our development from concept art to render to the PU cast prototype. 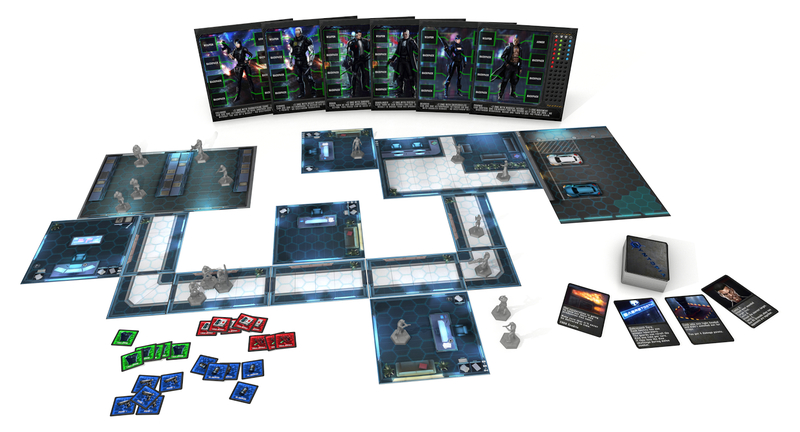 Randomized gameplay combined with the modular gameboard and random events to trigger can make your mission more difficult than it might look at first. Triggering an alarm can call more of those heavily armored guards to arms than you already cleared for this room before, and even be supported by Elites. Besides, don't forget they use equipment as well. A few of the items for you to loot and power up your team! One thing that should never be missed: loot. A lot of it - and everything for you to gather and enhance your team. Massively improve your firepower through additional weapons and armor, vanish in a wall of smoke or patch yourself up with a few medkits. Those items can either be bought for earned credits from previous Edgewalks or be found on the grid directly. The final itemchips you will receive with your game. Furthermore Cyntopia - the future is now comes with a set of 7 uniquely designed d6-dice to complete the setting for all of your missions. 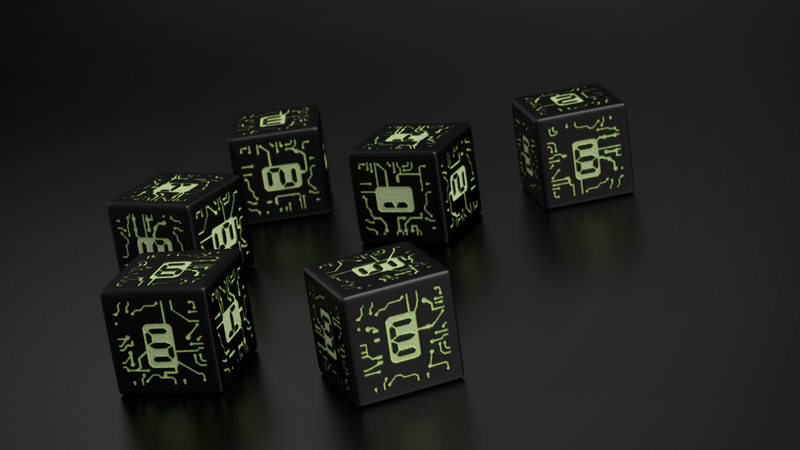 Custom cyberpunk themed dice for each member in your team. Various rooms and spaces with lots of opportunities - your future playground! Randomize your board in a selection of 40 already included floortiles. Each room offers different possibilities for you or the enemy to take cover in combat, as well as the chance to loot containers afterwards. Combined with your unlimited freedom in choice of story and quests, none of your Edgewalks need ever to be the same. Since you've come this far, surely you must be interested in Cyntopia - the future is now, so we would like to give you the possibility to test it before the campaign is even finished!. The Print & Play doesn't feature the whole rulebook, nor all game elements, but is meant to give you brief overview of the game. It features enough material for three Edgewalker and one GM. Last but not least, we ask you to keep in mind that we are a small, independent group of people trying to realize this project with your help and participation. We are not backed by an already-established company. We are not using Kickstarter just as a pre-order and promotion platform. We planned and created everything out of nothing - but to reach the final step and offer you the game, we need your help. We can safely assure you, every dollar will help us succeed in this project and will definitely be rewarded by us with a token of gratitude - and the option to offer you the final game and hours of fun. It doesn't have to be a large sum of money, it will still be support. Also, since your interest has brought you this far in the script, we'd like to encourage you to share it with your friends or groups who might be interested as well. could you lend as a hand over there, too? Stay tuned, and don't forget to drop by on our Facebook or our Twitter for new information and updates! Be aware of the Edge and meet us on the Grid. During the development of Cyntopia - the future is now, we had so many ideas and one of the hardest parts was to make cuts and decide what should actually become part of the game. Since we didn't want to discard those ideas, we've put them aside for you to unlock as stretchgoals. If your interest in Cyntopia - the future is now is as great as ours, we're sure we'll be able to unlock some great new content together. Here is a short overview of the first stretchgoals - the more we achieve, the more stretchgoals will be revealed. We want to keep the shipping costs as low as possible for all of our Edgewalker, so all shipping fees will be charged via our pledge manager, before the shipping starts. Charging a flatrate shipping price wouldn't be fair and we want to offer everyone the lowest possible shipping price. Keep in mind, that those are just approximate numbers and might change during the later stages of development. At the moment we've found a great partner in Wayland Games, which will arrange the shipping and packaging for us, so that every Edgewalker gets what was backed. Shipping costs for smaller pledgelevels and future add-ons will vary, based on location and weight. For more questions regarding shipping just send us a message and we'll answer them as soon as possible. Anyone who has pledged a Kickstarter campaign before knows something can always happen unexpectedly. Before the start of this campaign, we searched for great production- and distribution partner, so everything should run smoothly. Those include the famous LudoFact and Wayland Games, who will support our production and shipping as well. But if some delay should occur anyway, we'll let you know as soon as possible and work on a solution. After we're funded, we'll continue to work on the game design, polish the graphics, improve the gameparts together with our production partner based on your feedback keep you updated each week. We want to make sure, that Cyntopia will be as polished and great as we imagine it. This campaign will give us the funds needed to pay our hard working artists for their work and to publish the necessary amount of copies, so that all of you get their share. Get yourself 5 of our costum dice. +You'll get the digital art - & storybook. +Your name in the matrix of gratitude *Shipping charged after campaign ends. Choose between one of the two miniature only packages. Edgewalker: includes all 6 Edgewalker miniatures. Forces: includes 6 enemy miniatures. Get both miniature packages mentioned above for a cheaper price. Get yourself a copy of Cyntopia (which will include stretchgoals too). Get yourself a copy of Cyntopia (which will include stretchgoals too) as Collectors Edition including: + hardcover artbook + T-Shirt + signed and numbered artwork . Give one of the corporations their name and take part in the logo designing process - you'll get a signed screenprint of the logo, also +Get yourself a copy of Cyntopia . +You'll get one of the Cyntopia t-shirts. +You'll get the hardcover art - & storybook. +Your name in the matrix of gratitude *Shipping charged after campaign ends. You will be in the game as the head of the corporations. You will be designed as concept art and become a miniature for the game and get a signed screenprint of yourself. also +EVERY pledge level (limited and non limited) above. You get everything. [We take care for your accommodation and catering, you take care for your trip] *Shipping charged after campaign ends.